Culture Change Exchanges are interactive events that aim to educate, support and inspire individuals and organizations to shift away from institutional, medical models of care toward social models that embrace living. 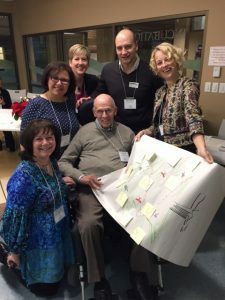 The Schlegel-UW Research Institute for Aging (RIA) hosted 3 Culture Change Exchanges between May 2016 and March 2017 with support from the Ontario CLRI hosted at the RIA. Working Together to Put LIVING First: A Guidebook to Change the Culture of Aging in Long-Term Care shares inspiration and practical strategies to support organizations interested in starting or continuing to change the culture of care in their long-term care and retirement homes. One of 3 Culture Change Exchange Events hosted by the Schlegel-UW Research Institute for Aging that aim to educate, support and inspire individuals and organizations to shift away from institutional, medical models of care toward social models that embrace living.